Daylite has already established itself as a pre-eminent organization and business-management tool on the Mac. The application from Marketcircle manages contacts, tracks projects and to-dos, schedules meetings, shares calendars, and essentially keeps everything organized for up to 50 users on individually licensed Macs. Marketcircle had announced back in June that it planned a mobile version of its management and organization app for the iPhone. That program hasn’t arrived in the App Store just yet, but Marketcircle has taken a big step toward delivering on that promise—it’s demoing a version of the iPhone app, dubbed Daylite Touch, at this week’s Macworld Expo. And the mobile application is on track for a release sometime during the first quarter of 2009. “We just have a few crashes to resolve and a few [interface] interactions we need to clean up before we submit it [to Apple],” said Marketcircle CEO and president Alykhan Jetha when I caught up with him Monday. Daylite Touch may still have a few kinks to iron out before it’s ready for prime time at the App Store. But the version on display at Marketcircle’s booth in the South Hall of Moscone Center is one of the deeper, feature-rich apps that has been built for the iPhone. Daylite Touch integrates with the desktop version of Daylite, letting users sync between the apps over 3G, EDGE, and Wi-Fi networks. But Daylite Touch works offline as well; users can book meetings, look at calendars, delegate tasks, and manage their projects without any sort of connection, and then sync the next time they’re online. 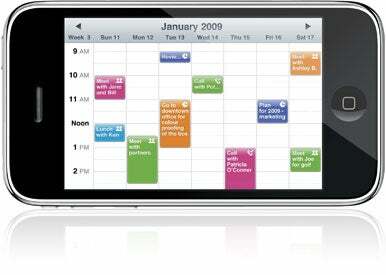 A Home screen gives you a synopsis of the day’s appointments, meetings, and tasks. You can also look at what’s in store on tomorrow’s schedule. Tapping on events gives you details of a specific event. Daylite Touch features a multi-user calendar—it not only displays your events in list, day, and month view, but it gives you the ability view the calendars of other Daylite users in your workgroup. (All the better for scheduling meetings, Jetha points out.) You can create multi-user meetings, sending out invite notifications; you can also create appointments by using multi-touch gestures on the calendar. Turn your iPhone sideways, and you’ve got a view of events for the coming week. A Tasks screen gives you the ability to bulk edit tasks, create subtasks, and link tasks to projects, opportunities, and contacts. You can also delegate tasks to other users and track tasks after you’ve delegated them. An Objectives area in Daylite Touch displays both projects and opportunities—Daylite-speak for things that are under your control like assignments and things outside your control like sales campaigns, respectively. You can sort projects by due date or priority, while sorting opportunities by close date, value to your organization, or probability. When you view a project or opportunity, you can see linked contacts, tasks, and plain text notes (which include e-mails received via the Mail integration features of the desktop app). Finally, a Contacts screen lets you enter both people and companies as distinct objects that appear in a single, searchable list. “I think, finally, we have a solution I’ve been dreaming of for many years,” Jetha said. Daylite Touch will require Daylite 3.9—which is also set for release during the first quarter of 2009. (Expect it to arrive before the iPhone app, Jetha said.) The app will work on the iPhone and iPod touch and require 100MB of free space on your mobile device.